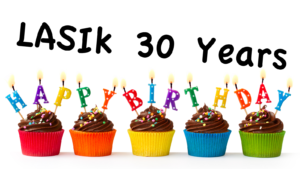 The excimer laser was first used on a live patient 30 years ago on March 25, 2018. While vision correction procedures have been performed for well over 100 years, the laser had never been used before. PRK (photorefractive keratectomy) was the first laser vision correction procedure which has developed into present day LASIK. The interest in the first laser vision correction procedure started in 1983. A novel scientific paper described the potential use of the excimer laser reshaping the curvature of the cornea to change the refractive powers of the eye. A team of research innovators began to test the concept using plastic test blocks then cadaver animal and human eyes. The excimer laser was an industrial tool having been invented for the manufacturing of microelectronic devices and semi-conductors. It had never been used on live tissue, not to mention humans. As the technique was refined, the team eventually used the laser on live animal eyes, but how to get permission to treat a human? The first patient to receive laser vision correction was named Mrs. Cassady. She had cancer of her eye socket. While the eye was healthy, she would need the eye removed if there were any hopes of successfully treating the cancer behind the eye. Mrs. Cassady gave permission for the team to treat her eye shortly before her cancer surgery was to be performed. The FDA agreed and gave permission to proceed. The procedure was a huge success. The FDA was impressed and later gave approval for clinical trials to begin using the laser. Laser vision correction had been born, thanks to the bravery of Mrs. Cassady. Both PRK (photorefractive keratectomy) and LASIK (laser-assisted in situ keratomileusis) use the excimer laser to reshape the cornea. The curvature of the cornea has tremendous influence in the refractive powers of the eye. The flap was originally created using an oscillating blade, but today we use a second type of laser called a femtosecond laser to create a precise flap. While the predictability of the two procedures is similar, LASIK has become the most popular form of laser vision correction, at least in the United States. LASIK is the most common type of laser vision correction we perform for all the reasons stated above. Patients are more comfortable, experience almost no discomfort, vision improves quickly and healing is rapid. The excimer laser gives me the accuracy and predictability to reshape the cornea to yield very reliable results. Happy birthday laser vision correction! We look forward to seeing you. If you would like to make an appointment or if you have questions, please call us.